Potato (92%), Coating (Modified Starches (1412, 1414, 1400, 1422), Rice Flour, Dehydrated Vegetable (Garlic <1%), Salt, Herbs (Rosemary <1%, Parsley), Acidity Regulators (450, 500), Natural Colour (150a), Malt Extract (Barley), Thickener (415)), Canola Oil. 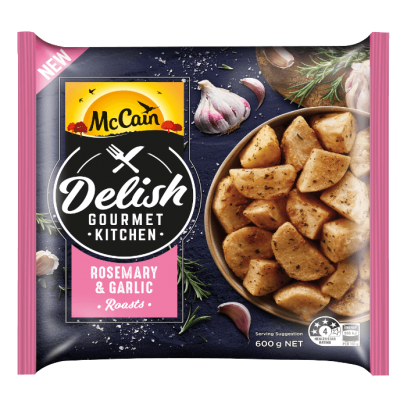 Spread McCain Delish Roasts in a single layer, on the middle shelf. Bake in oven for 10 minutes, turn and cook for a further 15 – 20 minutes until crisp and golden.